As an observer of people, I enjoy hearing tales of real-life romance. I confess I still watch the royal headlines because I am rooting for both of Princess Diana’s boys and their marriages. Recently, I learned of a real-life romance closer to home that is one of the most beautiful arrangements of God’s hand I’ve ever heard. Angelina is a dear friend to our family for her time, love, and prayers she’s given to our daughter. Our daughter has some mild special need situations and has participated in a ministry designed to remind everyone they have purpose and are deeply loved by God. Angelina signed on as a volunteer and was matched with Hannah. Their bond was instant, and Angelina signed on to be her “buddy” for the Tim Tebow Foundation’s Night to Shine prom. To say we love Angelina is an understatement. I knew of her from years ago when I saw her in high school and at church. Angelina will admit that her faith was not personal, and although she was sweet to Hannah during a kindergarten cheerleader camp, she wasn’t one you’d point out for being on fire for Christ. Fast forward and I’d heard she moved away, was back, and truly was on fire for the Lord. When I saw her at the first event as Hannah’s assigned buddy, the glow on her face told me her faith was real. It was an honor to have her pour into Hannah’s life because I knew Hannah was receiving prayer and wisdom from someone truly walking with the Lord. We talked here and there and when I shared a heartbreak that was close to me, she encouraged me. She shared how hard romance is, and even harder to stay true to Christ. She confessed that wasn’t a priority for her before, but her passion was to honor Christ with everything, including her relationships. If Christ wasn’t in it, she shared, she’d stay single. And she was okay with that and prayed her peers would catch the same vision. I lost touch with her for a while, and then Hannah announced there was someone in Angelina’s life. We both knew that wasn’t something she’d take lightly, so we knew he must be special. Not long after was the engagement announcement. At their wedding, I was blown away by their story. I’m sure I won’t get it word-for-word, but hopefully I capture the gist of God’s hand in their lives, and it will impact you as richly as it did for all of us that were there to hear. Dale and Angelina grew up on the same street. It was one of those situations where Dale would knock on the door and ask if Angelina and her brother could come out to play. Their families often crossed paths, and at the reception I was told that it was Dale’s family that shared the gospel with Angelina’s mom, and that is when her journey started. I don’t know the time frame, but they both returned to the Lord and moved back to town. My friend told me that the prime reason Angelina returned was for her education. Our local college had the exact program she needed to pursue her degree. It was one where only a handful were chosen, and Angelina got in. The author in me keeps wondering, what if she had not returned for that program? Who knows where the story would have went? I’m so in awe of His Providence in all of this. What Angelina didn’t know was that Dale had a crush on her from the time they were kids. With both back in town, both serious in their relationship with Jesus, he didn’t want to miss God in whatever the plan for his life was. He sat on his confession until the Lord showed him it was time. Dale had an opportunity and like all those times he visited his neighborhood friend, he knocked on the door. This time, though, was different. He confessed his feelings only to learn she’d felt the same. These childhood neighbors are now husband and wife. I love this story so much! To celebrate real-life romance and congratulate Dale and Angelina on their marriage, I’m going to pick ONE random comment directed to congratulating Dale and Angelina and give that winner a copy of Engaged AND the book Hannah wrote with me that includes a neighbor romance, You’re Beautiful. US winner can choose either print or eBook. International winner will be given the eBooks. Thank you, Angelina and Dale, for letting me share God’s story about redemptive romance, neighbors, and about two wonderful people who we wish decades of oneness to! Hi Julie! Thanks for sharing this inspiring romance and the interaction Angelina has with your family. Uplifting how God works often in mysterious ways. Best wishes. Enjoy your weekend. Happy Writing. Thank you, Renate! Happy weekend to you, too! Hi Julie, thanks for sharing. How special to hear about a real life romance:) What a wonderful example for your daughter. Thank you, Wemble! It has been a beautiful story to watch. Congratulations Angelina & Dale on your marriage. Thank you for reading, Christina! What a beautiful story. Congratulations 🎊 on your wedding Angelina and Dale. May God bless you both with much happiness. I just love the story every time I think of it. Thank you for reading, Lucy! 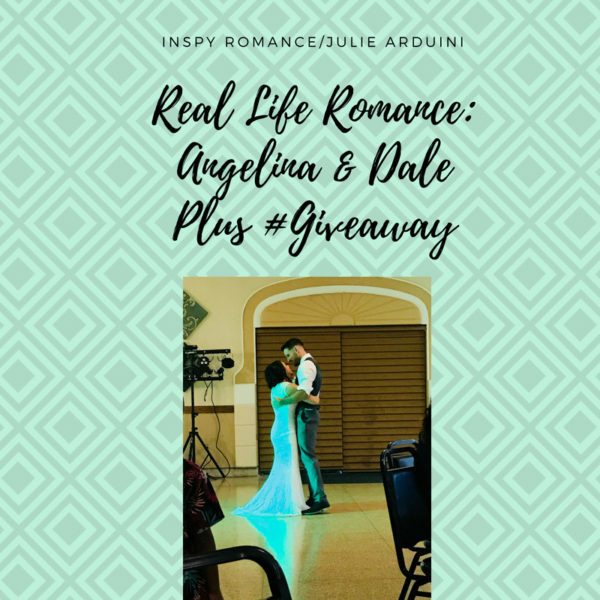 Congratulations to Angelina and Dale! What a wonderful reminder of God’s redeeming love! Congrats sounds like a good read. Goodness, A huge Congrats to Angelina & Dale! What a lovely testimony! I would treasure reading these stories! What a beautiful story! Congrats to the childhood neighbors! Isn’t it just the sweetest story? It was so neat how everyone kept saying what a great book it would be. I agree! Thank you for reading, Lila! What a beautiful and heart-warming love story. If we wait on the Lord, He will give us the desires of our heart. What an amazing verse. I love it, and it fits perfectly. Thank you for reading! What an awesome story! Congrats to Angelina and Dale. Wonderful story of Gods redemption! Congratulations to the newlyweds!! Stay on your honeymoon for the rest of your life. Hold hands in church! It’s surprising how many couples don’t do that. We’ve been married 38 years and hold hands frequently. It always surprises me how many comments we get about that. Forgive quickly, encourage frequently, love constantly. God bless abundantly!! What beautiful advice. I’m going on 22 years and that’s advice I could use, too! Nothing is impossible with God! Thanks for sharing their story with us. Wow! I loved this story. A Redemptive Romance…so true and lovely. Thanks so much for sharing and inspiring us! Thank you for reading, Candi!